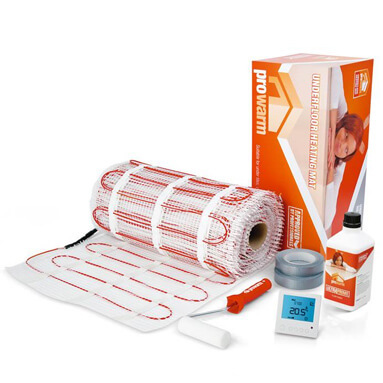 Prowarm underfloor heating kits contain everything you need to install them, along with detailed installation instructions, all packaged in one box. ProWarm 150w underfloor heating mat kits are available in the following square metre sizes (please choose from the drop-down box above): 1M, 1.5M, 2M, 2.5M, 3M, 3.5M, 4M, 4.5M, 5M, 6M, 7M, 8M, 9M, 10M, 11M, 12M, 13M, 14M, 15M, 16M, 17M, 18M, 19M, 20M, 21M, 22M, 23M, 24M. The maximum mat size in one piece is 12m2 - anything larger is supplied as multiple mats. Prowarm digital thermostat. Select your desired model from the drop-down box above. High quality roller. For applying primer to sub-floor. Adhesive tape. To assist in holding the mat in position during installation.